Sarens has demonstrated the advantages of its new ‘mobile’ pedestal crane, the PC 3800-1, on a wind farm project in Germany. A pedestal crane is, essentially, the body and upper of a standard lattice boom crane, mounted on giant outriggers, rather than on a crawler carrier. This increases the crane’s load chart and allows it to be levelled on ground that is not perfectly flat. While pedestal cranes offer advantages on sites where extra lifting power is needed, and where ground preparation is difficult, such as wind farms, they needed to be fully dismantled between jobs. The carbody of the PC 3800-1, which is based on Terex-Demag’s CC 3800-1, has special adapters for Faymonville G-SL axle lines. It is transported to site, towed by a three or four-axle truck. At the site, the trailer is converted into an SPMT by connecting Faymonville’s APMC ‘assist’ power pack. As such, the trailer can be used to move the partially rigged crane upper and its folding outriggers between turbines. 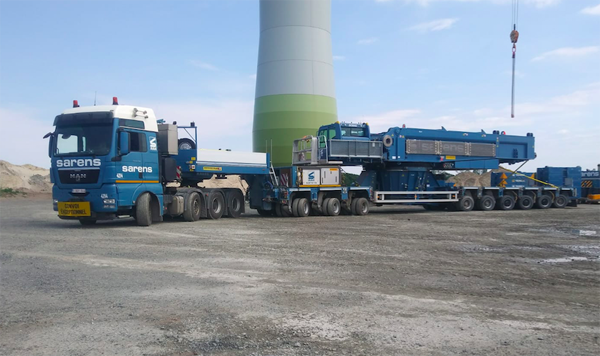 Once the crane is set up on the outriggers at the next turbine, the trailer can then go back to move the fully-rigged Superlift mast system in one go. This job marked the first time Sarens had demonstrated how the crane and its fully-rigged Superlift mast can be moved. On windfarms, where standard 600-700t class crawlers are already working at close to capacity, solutions are urgently needed to allow for the installation of heavier nacelles on taller towers, without losing time to disassembly between turbines. Sarens, using a Liebherr all terrain and Merlo telehandler alongside the PC 3800-1, erected three 159m-high wind turbines as well as a smaller 99m turbine at the Renkenberge wind farm in Germany on behalf of client Enercon DE. Hendrik Sanders, the technical solutions equipment engineer for Sarens, explained the innovative solution: "In Renkenberge, the first ever relocation of a PC 3800-1 was performed in partially rigged mode. Once the crane body was put on its outriggers at the crane platform, the six axle self-propelled trailer was used to transport the fully rigged 42m Superlift mast, which had been put on timber stillages at the former location. This made it possible to perform the crane relocation in eight hours' less time, compared to a full dismantling and rigging." For this job, the crane was rigged with Superlift, and used the maximum 12m x 12m outriggers available when working with the Superlift ballast; when working with main boom alone, the PC 3800-1’s folding outriggers can be set to a base of 14m or 16m, which boosts its capacity.